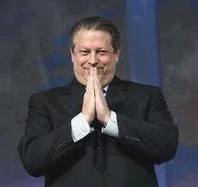 The Church of the Warming Globe is losing its fire, and global warming extremists have grown increasingly desperate in their efforts to convert the masses to their religion. Those missionary’s still actively trying to convert the unbelievers and save us all from extinction are meeting increasing skepticism when they’re not being outright laughed at. Pat “I’d like to buy a vowel” Sajak has even chimed in, at a publication called The Ricochet, (and we can’t discern whether he is being serious or sarcastic) in which he essentially suggests that the only way alarmists will win any additional converts is to practice what they preach, thus in time producing measurable results proving their argument. Others are seeing a different approach, and as desperate times call for desperate measures, every weather anomaly is quickly being touted as further proof of global warming. Remember when we joked that it was snowing in Houston and Baton Rouge, in December, for the second year in a row? The response was “that’s weather, not climate.” But when, last week, it was reported that Russia had been experiencing her highest temperatures and longest drought in 130 years, the head of Russia’s branch of the WWF quickly claimed that this was evidence of climate change, and that “such climate abnormalities will only become more frequent” in the future. Interestingly, he failed to explain why a similar weather pattern had occurred 130 years previously without such presumably catastrophic results! Conversely, little to nothing has been said about a deadly chill which has been impacting South America due to an inrush of air from the Antarctic that has killed hundreds and caused the continent’s coldest winter in years. And closer to home, our National Oceanic and Atmospheric Administration (NOAA) has been reporting that, according to its worldwide temperature data, the first half of this year was the hottest such period ever recorded. Interestingly, according to the science blog Watts Up With That, the warming is curiously concentrated in areas where NOAA has its fewest weather stations. Greenland, one of the two hottest locations, has no weather stations at all! And of course, since so much of the Gospel of Global Warming is dependent on scientific research that was brought into question with the release of many of the researchers’ email, the newest sermon suggests that since the scientists and their methods were reviewed by “independent panels” and vindicated, their science has thus been vindicated, and validated, as well. Our examination of the members of those panels would suggest that they were far from independent, and that their conclusions prove nothing resembling vindication or validation. The New York Times, in an editorial today, essentially suggested that climate change alarmists should throw in the towel, and find a new religion. But this doesn’t mean that we should mourn the death of cap-and-trade. It’s possible that the best thing to do about a warming earth — for now, at least — is relatively little. This is the view advanced by famous global-warming heretics like Bjorn Lomborg and Freeman Dyson; in recent online debates, it has been championed by Jim Manzi, the American right’s most persuasive critic of climate-change legislation. Their perspective is grounded, in part, on the assumption that a warmer world will also be a richer world — and that economic development is likely to do more for the wretched of the earth than a growth-slowing regulatory regime. He goes on to note that liberals lean toward a belief in catastrophe, while conservatives are more, well, conservative. But you can see why conservatives might lean toward the wisdom of inaction. Not every danger has a regulatory solution, and sometimes it makes sense to wait, get richer, and then try to muddle through.